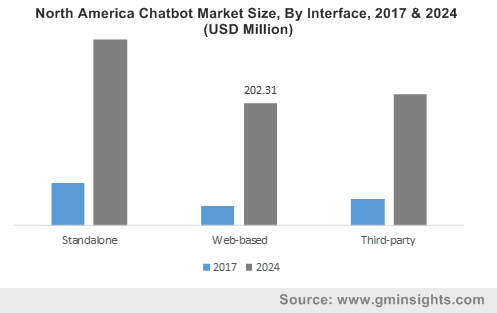 Entertainment « Global Market Insights, Inc.
With the recent advent of smart socks, smart shirts, & even smart jackets, smart clothing market has been gaining momentum in the category of smart and future wearables technology. Smart clothing or e-Textile is steadily becoming a reality, as sensors, electronic, and digital technologies have blended seamlessly to offer the functionality of smart devices to textiles & clothing. This convergence of textile and digital industries is set to bring huge commercialization and standardization to the worldwide smart clothing market. 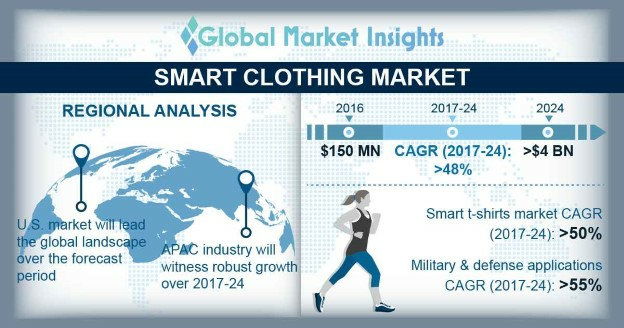 As per a report compiled by Global Market Insight, Inc., smart clothing market is projected to grow at a healthy CAGR of 50% over 2017-2024 in terms of shipments. Smart clothing industry has been forecast to face certain challenges at its initial stages, notwithstanding the predictions made about it being one of most lucrative businesses in recent times. Some of these constraints lurk along the lines of high product prices, unreliability, and personal security threats. Moreover, on the technical front, the present-day challenges of smart clothing industry such as limited battery life, wireless technology, huge capital investment, wash ability, and complexity of data analysis remain consistent. Data security and processing speed play a crucial role in healthcare, military & defense, and sports, on the grounds of which they can be classified as the prominent application arenas encompassed by smart clothing industry. The on-going research and advancements in sensor technology, the Internet of Things, and big data analysis, will prove to be reliable sources that can help smart clothing technology go mainstream. Industry experts foresee smart clothing market to move in a positive direction, as this technology holds immense growth potential across myriad application sectors. 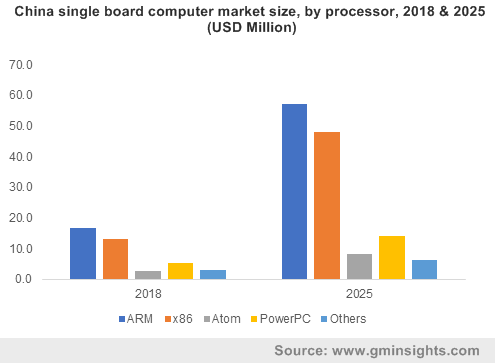 Companies are expected to pour in huge investments to develop this technology and expand its application spectrum. Moreover, with more and more players planning to harness the power of smart technology in the clothing industry, it is quite obvious for the wearables sector to witness a slew of product innovations. For instance, Google has been working with Levis on smart jackets that would allow the users to interact with their devices and control applications like music player, camera, and navigation. As technology evolves, it is expected that the global smart clothing market will facilitate colossal growth opportunities in healthcare, sports & fitness, military, and industrial applications. Smart clothing is seen as a way to revolutionize and transform the healthcare sector, as it offers a huge potential for helping to improve an individual’s health. Smart clothing industry players are focusing on the idea of weaving electronics into a fabric like a shirt, or cap, or blanket that could perform specific patient care functions. Moreover, many medical device manufacturers and healthcare providers are actively monitoring smart clothing pilot projects and research that can track chronic diseases, help patients feel comfortable during hospital stays, track their health status, and boost health insights. Several government institutions are investing in smart clothing industry to develop military uniforms that are technologically advanced and can also provide insights on the health of soldiers, injuries, the impact of bullets, explosions, and the like. This would generate lucrative growth prospects for smart clothing industry expansion in the military sector. As per estimates, the military and defense application within smart clothing market is estimated to witness the highest annual growth rate of 55% over 2017-2024. The prominent players partaking in smart clothing industry share have been emphasizing on building partnerships with tech-giants & clothing firms, in conjunction with targeting their focus on diversifying their service spectrum. Recently, a Japanese startup firm Xenoma has launched a motion and gesture-tracking smart shirt called as the e-skin. Having been integrated with stretchable wires, sensors, and textile, e-skin is set to provide a larger platform for fitness and health monitoring. Ralph Lauren, Athos, and Catapult Sports are some of the other industry giants, who are actively investing in commercializing smart clothing technology in the coming years, which would undeniably create a profitable growth map for smart clothing market. This entry was posted in Sustainable & Smart Technologies and tagged Entertainment, Healthcare, Industrial, Jackets, Military & Defense, Pants, Shoes, Smart Clothing Market, Smart Clothing Market Analysis, Smart Clothing Market Forecast, Smart Clothing Market Size, Socks, Sports & Fitness, T-shirts, Undergarments. Ezetap’s recent acquisition of FortunePay is a vital indicator of the growth in (Point of Sale) POS Terminals market. Similar to the growth strategies adopted by most markets, mergers & acquisitions and novel product launches primarily form the strategy landscape of POS terminals industry as well. In June 2017, Bangalore based POS firm Ezetap had acquired FortunePay, an online payment & physical payment service provider to banks in India. This deal is anticipated to help Ezetap avail the latter’s infrastructure and become a sole payment service provider for the traders in India. Earlier in June 2014, Ezetap had also collaborated with SBI (State Bank of India) to install 500,000 point of sale terminals across India over the coming five years. With more and more companies undertaking strategic tactics, POS terminals market is sure to carve out an appreciable growth map over 2018-2024. In January 2017, Fujitsu, a Japanese multinational IT equipment & service firm, launched Fujitsu TP8TM, a family of retail POS terminals, which was developed to optimize and improve the online payment performance across supermarkets, department stores, drug stores, and mass merchant stores. The new product also enhances the shopping experience of the customers across retail stores through its exceptional modularity. These new product innovations are expected to result in the robust expansion of POS terminals market. In February 2017, OMA Emirates Group, a UAE based payment service provider, purchased MobiSwipe, one of the leading mPOS service providers. The acquisition will help OMA to expand its service portfolio across APAC, Middle East, and East Europe. MobiSwipe permits traders to make use of smartphones and tablets as POS terminal devices to accept payments via debit or credit cards. In a vital breakthrough, MobiSwipe, now a part of the OMA Emirates Group, in April 2017, announced the setup of more than 50,000 mPOS terminals in India within nine months. This is an instance of how major firms have been taking key initiatives to promote cashless deals in the country and explore new business growth avenues across India (Point of Sale) POS terminals industry. In May 2017, Mswipe, a startup firm in the mPOS terminals industry, formed a joint venture with PayU India, a digital payment service provider, to expand its online payment business through the purchase of the latter’s offline merchant acquiring business. As per the reports from reliable sources, PayU had acquired more than 9000 offline traders across India, who, along with their point of sale business will be moved to Mswipe. Dealers transacting with Mswipe can now use PayU India’s online payment options. According to expert opinions, the strategic alliance between the online payment service providers will benefit both in terms of revenue generation as well the consolidation of their positions in POS terminals market. In July 2017, ScanSource Incorporation, a leading service provider of point-of-sale, barcode, networking, and data solutions, acquired POS Portal Incorporation, distributor & renter of POS devices, for USD 144.9 million to extend and improve its POS payment services across the globe. This is ScanSource’s sixth acquisition since last three years, with its recent purchase being Intelisys, a technology service distributor and master agent of carrier, telecom, & cloud solutions, for USD 83.6 million in June 2017. The same year also witnessed NEXTEP SYSTEMS, a provider of self-order POS services, form a strategic alliance with LevelUp, the largest mobile payment platform developed by Massachusetts-based startup firm SCVNGR. The alliance will enhance the service efficiency of both the firms by offering more effective and user-friendly online payment options. Speedy self and mobile ordering operations, ensuring a seamless and personalized experience for the users are expected to spur the business expansion and ROI of both these firms, thereby providing a boost to POS terminals industry. 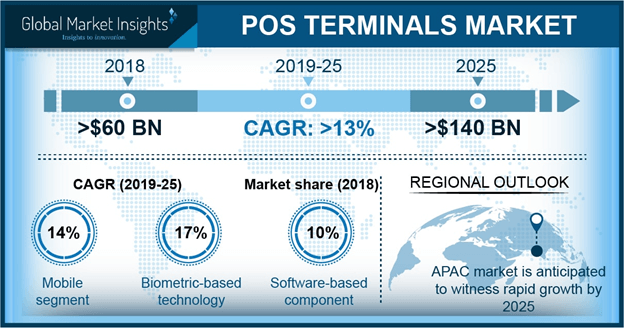 Global Market Insights, Inc., claim POS terminals market share to surpass USD 125 billion by 2024. POS terminals industry is an evolving business sector with big players investing heavily in R&D activities to develop new technologies and products for gaining competitive edge. It is more likely that rapid expansion of POS terminals market will encourage new service providers and manufacturers to enter the business further encouraging the existence of fierce competition in the industry. VeriFone Systems Inc., Panasonic Corporation, Ingenico Group, PAX Technology Inc., and Toshiba Corporation are some of the major brands of POS terminals industry. This entry was posted in Electronics and Media and tagged Biometric, Entertainment, Fixed, Global POS Terminals Market, Hardware, Healthcare, Hospitality, Linux, MAC, Mobile POS Terminals Market, Point of Sale Terminals Market, POS Terminals Industry, POS Terminals Manufacturers, POS Terminals Market, POS Terminals Market Report, POS Terminals Market Share, POS Terminals Market Size, Restaurants, Retail POS terminals market, Service, Software, Traditional, Warehouse, Windows.